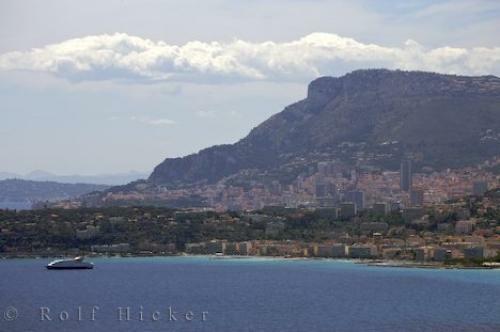 Looking at the city of Monte Carlo, Monaco situated along the coastline of the Provence near the Italian/French border. The beautiful city of Monte Carlo, Monaco is surrounded by the Mediterranean Sea and is one of Europe's leading tourists resorts. Monte Carlo, Monaco is known for its fast paced life consisting of casinos, glamour and famous people who come to Monte Carlo for the excitement. Coastline looking from near the Italian / French border, Cote d'Azur, Corniches de la Riviera, Europe. Photo of the city of Monte Carlo, Monaco, Europe.